★[MULTI-ANGLE TEMPLATE TOOL]: The angle gauge can lock any angle desired for reusable template, you can move a variety of directions to achieve endless applications. Suitable for DIY. 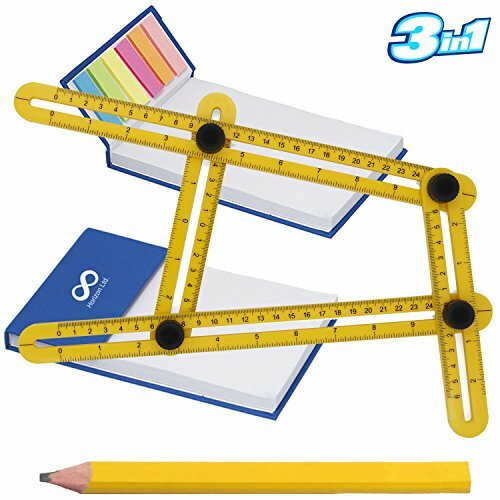 ★[MULTI-FUNCTIONAL ANGLE RULER TOOL]:You can create a professional layout in the tiles, flooring, brick, stone, wood, laminate, metal and many other environments. ★[ACCURATE MEASUREMENT]: All arms of angle template tool are with metric and imperial measures for double calibration. Adjustable arm can slide freely, accurately measure various irregular patterns. Quickly and easily mend all shapes and angles. It can easily track repetitive patterns and can be operated with one hand. ★[MATERIAL]: ABS plastic material, durable and easy to carry, with excellent impact intensity and good rigidity. The figure is clear and easy to read, effectively help us to accurately measure. ★[WARRANTY DESCRIPTION]: You will get a ruler and An index card and woodworker pencil. if you are not satisfied, we will give you a 100% refund. The ruler is easy to use. This makes life so much easier! Great angle ruler for any handyman or carpenter! Very lightweight, but works like a charm!